The two-story Queen Anne house at the corner of Seventh and Boots streets in Marion, Indiana, looks as if it could be the setting for a whimsical children’s story, maybe an address for a visit by the Cat in the Hat. The 1880s brick structure, quirky in its asymmetry and steep roof angles, features three fireplaces, carved wooden mantels and impossibly high ceilings. In many ways, it’s a perfect home for an after-school program with a name Dr. Seuss would have loved -- The Brain Kitchen. In Marion, a struggling rust-belt city 70 miles north of Indianapolis, children come to this Seussian home two afternoons a week for a unique combination of yoga and trauma therapy, puppies and painting, and a sizable portion of cooking -- including the baking and sharing of bread that evokes aspects of the Lord’s Supper. The independent nonprofit program is the brainchild of Amanda Drury, who teaches youth ministry and practical theology at Indiana Wesleyan University and is currently writing a book on trauma and the resurrection. 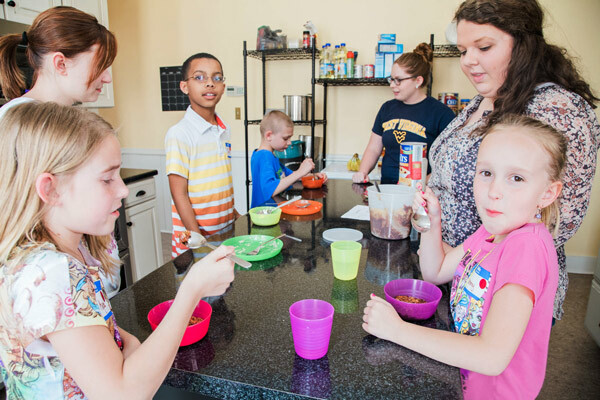 Focused on 9- and 10-year-olds, The Brain Kitchen debuted in February, serving 15 children, and concluded its first season in April. Efforts are afoot to bring it back in the fall. For those who lead churches and other Christian institutions, The Brain Kitchen is an example of how innovation happens -- with sudden insight, small steps and experimentation. 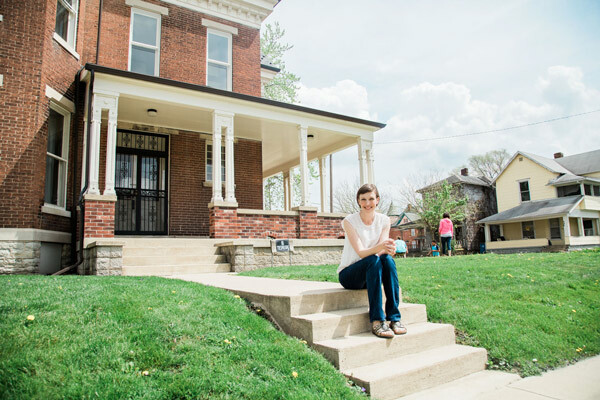 Founder and executive director Amanda Drury sits in front of the Jay House, home to The Brain Kitchen. While Drury hesitates to put labels on The Brain Kitchen’s children, they come from a school where more than 90 percent of students qualify for the federal free lunch program. Though a wide variety of children attend the program, they and their families share the challenges of living in a city that in 2015 had the highest child-poverty rate in Indiana, a place where many factories have closed and people are struggling to recover. How can your organization ensure that it sees and is attuned to “the hard realities” in your community? So on Wednesdays and Fridays, a school bus pulls up to the Jay House and unloads a diverse crew of third- and fourth-graders from Marion’s Allen Elementary School. On a recent Wednesday afternoon, the dozen kids who stepped off the bus were wrung out from a day of standardized testing. The first girl through the door wrapped her arms around one of the Indiana Wesleyan students who make up The Brain Kitchen’s volunteer corps. A second girl shrieked and took a flying leap into the arms of another volunteer. They were followed by a boy who seemed to be sleepwalking and another who entered the house just shaking his head, as if the kind of day he’d had was beyond explanation. And on it went. They shed their backpacks into cubbies, but on any given day, it’s hard to know what kind of emotional loads the kids may also be carrying, Drury said. Whatever burdens they bring, she wants them to feel at home. In addition to the warm hugs they receive at the door, the kids are also welcomed by the smell of warm bread on many Fridays, when it’s baking day at The Brain Kitchen. After the kids arrive, the college volunteers take a quick survey, asking them how their “engines are running.” Too fast? Too slow? Just right? Over the next two hours, The Brain Kitchen aims to help the kids get to “just right” by learning techniques and skills to calm themselves and, perhaps over time, even rewire their brains to help cope with challenges they might face. The basic recipe for The Brain Kitchen involves rotating the kids through a trio of stations -- one focused on movement, one on soothing and one on cooking. While Drury’s expertise lies in spiritual formation, she’s collaborated with experts from Indiana Wesleyan’s social work and occupational therapy programs to create The Brain Kitchen’s programming. What expertise is needed to address major problems in your community? Where can your organization find and recruit that expertise? 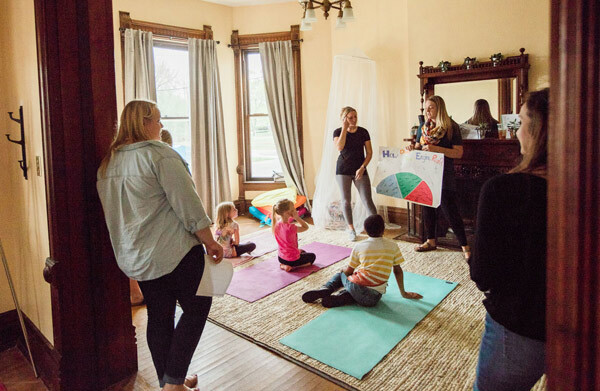 The movement component was developed by occupational therapy graduate students Chelsea Hershberger and Olivia Rudd, who came up with a yoga-flavored curriculum. It employs physical activities -- stretching, twisting and the like -- that involve reaching or kicking across the imaginary line running down the center of the body, the “midline,” to build connections between the emotion-controlling right brain and the more analytical left, they said. Volunteers from Indiana Wesleyan University survey the kids with a simple question, "How's your engine running?" Other activities -- log rolling, balling up, balancing on one foot, jumping in place and more -- help the kids focus on their bodies, gain spatial awareness and concentrate. The movements also help them burn off the stress of a day spent tethered to a school desk. And as they bounce, dance, hop, crab walk and tumble through the former front room of the grand old Jay House, the kids also look to be having just plain fun. The program’s soothing component -- conducted in what were once the dining and living rooms of the Jay House -- helps the kids decompress further. They can crawl into an inviting, nestlike hanging swing and read a book or listen to music. They can trace their fingers along the smooth wooden grooves of a tabletop labyrinth, or brush water onto a Buddha Board, creating designs and images that disappear as the water evaporates. Here, too, the kids can expand their minds by meeting visitors from the community -- a musician with a guitar, a television reporter with a camera, a doctor with some items from his medical bag, a service dog trainer with her puppies. Drury said the visitors give the children a glimpse of potential vocations and, in the case of the doctor, an up-close look at someone who grew up on these same streets and overcame the pull of gangs. On that recent Wednesday afternoon, service dog trainer Jil Mazellan was back for a return visit, this time with three golden labradoodles. The puppies, Drury said, are a magical calming tool, even for the most rambunctious kids. Puppies are a magical calming tool, even for the most rambunctious kids. 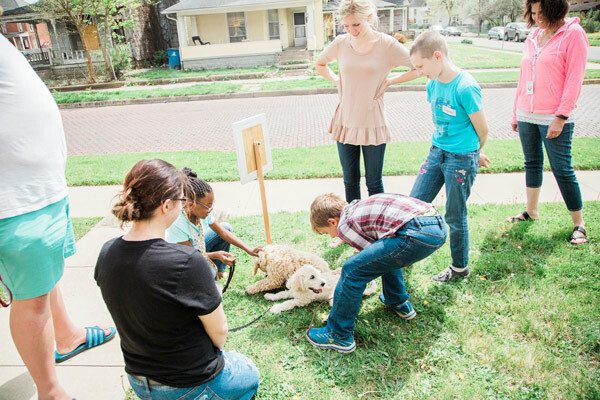 On the lawn outside, the kids put the labradoodles’ calming abilities to the test. Some, including a live wire nicknamed “Peanut,” weren’t so much leading the pups on a walk as dragging them across the grass. At one point, Peanut saw a friend passing on the sidewalk and ran to say hello. He dropped the leash, leaving a pup named Maggie untended. Once Peanut was reined back in, Mazellan gave him a gentle reminder not to abandon his post. And he stuck with Maggie the rest of the session. “It is the responsibility of the leash that keeps them grounded,” Mazellan said. But the afternoon cooking sessions may be the most powerful aspect of The Brain Kitchen. The kids initially get 30 minutes in the kitchen to make their own after-school snacks, and later, about 45 minutes to work on a meal -- bread and soup -- that they take home to their families on Fridays. The snack on that recent Wednesday was a sticky concoction the kids made from honey and oats, chia seeds, chocolate chips, and mashed bananas. It was healthy, high-energy and required lots of stirring. The banana smashing also became part of a discussion about channeling anger in safe, harmless ways. Brain Kitchen kids enjoy a sticky snack they made from honey and oats, chia seeds, chocolate chips, and mashed banana. The energy bites were a tasty hit, in both the making and the eating. One boy gobbled down his bowl of mashed goodness and went for a second. Maybe he was just a growing boy, but Drury said food security is a concern for many children in Marion, including some at The Brain Kitchen. To ease those worries, Wendy Puffer, an interior design professor at Indiana Wesleyan, planned the kitchen with open wire shelves instead of closed-door cabinets so as to reassure the kids when they walk in that plenty of food is available for everyone. How can your colleagues’ skills and talents be put to use in new and exciting ways? In addition to addressing food scarcity, The Brain Kitchen teaches the children essential kitchen skills. They learn to cut vegetables (using safe plastic utensils), measure and mix ingredients, follow directions and use basic kitchen tools such as a can opener. What all the midline crossing, banana smashing, can opening and other Brain Kitchen activities add up to is an effort to help the children manage trauma, which Drury defined as “negative events beyond the child’s normal coping skills.” When situations unfold that make the children angry or upset, they are coached to step away. For situations that arise at home, they’re encouraged to go to their rooms and pound a pillow or throw a stuffed animal against the wall. The Brain Kitchen isn’t doing “trauma therapy,” but its programs are “trauma informed,” Drury said. Techniques such as midline-crossing exercises help put those folders in the right place. Evidence of The Brain Kitchen’s effectiveness is mostly anecdotal. The college students noted progress in the way the children have become easier to manage. Drury talked about one out-of-sorts little boy who asked for a drawing paper and a quiet office to find his inner peace, and a girl who’d been prone to punching who kept a lid on her anger when accidentally knocked down by a boy -- and went on to exchange notes of apology and forgiveness with him. A parent, Jalesa Resnover, said her son has struggled in school with attention deficit hyperactivity disorder (ADHD) but is now better channeling his rage through the techniques he’s learned at The Brain Kitchen, which she credits for his progress in school. 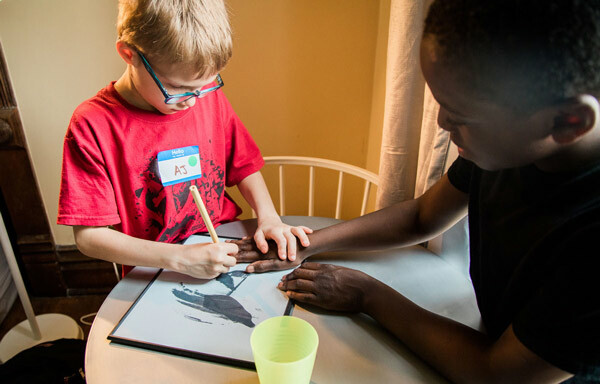 AJ traces a friend's hand on the "Buddha Board," where images magically disappear in moments. The Brain Kitchen has come a long way from the idea Drury conceived a year ago almost on a whim when she attended a ministry-hatching event at Princeton Theological Seminary. Since Indiana Wesleyan was set to host a similar event, Drury thought she ought to see one in action. But the host at Princeton told her she couldn’t just watch; she had to bring along a new ministry idea. With little thought, Drury came up with an after-school program that infused elements of trauma therapy and cooking, and her husband conjured “The Brain Kitchen” name. Yet by the time she left the conference, Drury realized she might be on to something. She applied for a Ball Venture Grant and suddenly had $17,000 to work with. The Brain Kitchen was created almost by accident. How can your church intentionally and systematically create new proposals for ministry? With one semester of The Brain Kitchen complete, Drury is looking for money to bring it back in the fall, maybe with a part-time director and a larger oven. She’s still finalizing all the details, but she’s hopeful. One small source of funding was unexpected: churches in Marion want to buy the children’s baked bread for their communion services. It’s something Drury wants to make happen if for no other reason than the community connection. And bread making is important in The Brain Kitchen. Each Friday, the kids take home three loaves of bread -- one to eat, one to save and one to give away. The idea, Drury said, is to teach them about philanthropy. Theology isn’t pounded into the kids with a rolling pin at The Brain Kitchen; it’s baked in. Each Friday ends with a ceremony where the kids gather inside the old house and share a communal loaf of bread. Each child pulls off a piece and tells the group something he or she is thankful for. How can your church or organization make sure that it sees and is attuned to “the hard realities” of life in your community? What can it do to help address them? What kind of expertise is needed to address the major problems in your community? Where can your organization find and recruit that expertise? The Brain Kitchen was created almost by accident when Drury had to come up with a new ministry idea for a meeting she was attending. How can your church intentionally and systematically create new proposals for ministry?